Spend an hour, an afternoon or an entire day zipping around the lake on jet skis. The entire family will enjoy the wind in their faces and the freedom jet skis give to enjoy the lake from one end to the other. From traditional paddling to paddling with your feet in kayaks built for one or two, you’ll follow miles of shoreline into quiet coves and around the many islands as you set your own pace of enjoyment. One of the fastest growing water sports in America, paddle boarding gives you lots of options…from sitting to kneeling and standing…giving you every opportunity to learn and enjoy this amazing sport. Whether you own a boat or rent one, your friends and family will have a blast tubing on the water. The only skill required is to hang on and enjoy the ride! Whether you own your own watercraft or choose to rent, you’ll find everything you need at the four beautiful marinas on Elephant Butte Lake, including boat slips & moorings, fuel, boat & Jet Ski rentals, wakeboard rentals, aqua lodge rentals, supplies, clothing, souvenirs and more. Enjoy New Mexico’s largest lake in comfort with friends and family on a pontoon boat. Perfect for relaxing, fishing and anchoring in one of the many coves for a swim, pontoons can be rented year round. Explore miles of Elephant Butte Lake State Park’s open water, coves and coastline! You’ll find several launch sites for your boat, but you can also rent speedboats and ski boats. Elephant Butte Lake is popular with sailors throughout New Mexico and beyond, and is home to the Rio Grande Yacht Club. The club organizes racing through the spring, summer, fall and winter, as well as year-round social events and occasional overnight “raft-ups” and club cruises. RGYC also operates a mast-up storage facility for sailboats near the Marina Del Sur launch ramps. Choose from four different sites to launch your boat at Elephant Butte Lake State Park…Marina del Sur, Rock Canyon Marina, Dam Site Marina and the Monticello launch site. Some ramps may be closed at various times of the year, but you can call 575-744-5923 to learn which are open. Fun for friends and the entire family, the Party Barge is a 40-foot platform which can be permanently anchored near any of the marinas. The barge is equipped with a swim ladder, picnic table, BBQ grill and a shaded area on one end, with cleats on both sides for easy docking. You can even stay overnight on the barge! The wet and wild thrill of wakeboarding will bring you back to the lake again and again. Don’t have your own boat, wakeboard or lifejacket? No worries. You can rent them. Enjoy! Enjoy the wind in your face as you ride the waves from one end of Elephant Butte Lake to the other! And here’s the great news…if you don’t own your own boat, you can rent one! Enjoy Elephant Butte Lake from sunup to sunset and all night long with the privacy of your own Aqua Lodge. Aqua Lodges are 40' houseboats that are permanently anchored in a cove behind Rock Canyon Marina. If you don’t own a boat, you can choose a package that includes a pontoon. What a relaxing way to camp right on the water with a little extra comfort and convenience! Lakeside RV camping is one of the many things that sets Elephant Butte lake apart from most other lakes in the country. You can enjoy stepping out of your RV just a few feet from shore, making it easy to swim, play on the beach, or launch your boat, kayak or jet skis. Imagine waking up to a gorgeous Elephant Butte sunrise each morning! You can fish, swim, relax, read a book, sun bathe, jet ski, kayak…whatever you choose to do…all with the water just a few feet from the flap of your tent! Sometimes it’s the simplest things that you remember most. Take time to build a sandcastle with your kids…or get your friends together to create a giant sand sculpture. Either way, it’s a simple and easy way to have fun and create memories! One thing you’re sure to have plenty of at Elephant Butte Lake is plenty of blue sies and sunshine. So take a break from the hustle and bustle of everyday life and spend some time on a beach towel in the sun. Read a good book…take a nap…listen to you favorite music, and just enjoy! Catch the breeze off the lake as you launch your kite high into the blue skies over Elephant Butte Lake. Whether you’re a novice or serious kite flyer, you’ll find the lake is the perfect place to fly with its wide open spaces and dramatic scenery. With the Luchini Trail and West Lakeshore Trail offering more than 11 miles of scenic trails around Elephant Butte Lake, you’ll have every reason to walk, hike or bike. Plus, if you’re up for a climb, you can hike up Turtleback Mountain for breathtaking views of the lake and surrounding mesas & mountains. You’ll find plenty of sandy beaches from which to go swimming, but you’ll also want to explore the many coves on Elephant Butte Lake by boat. Coves are a great place to anchor, swim and even explore the shoreline. You’ll find a variety of birds at Elephant Butte Lake year round, and the spring and fall offer exceptional seasonal opportunities to see American White Pelicans, Sandhill Cranes, Snow Geese, Western & Clark’s Grebes, Terns and more. 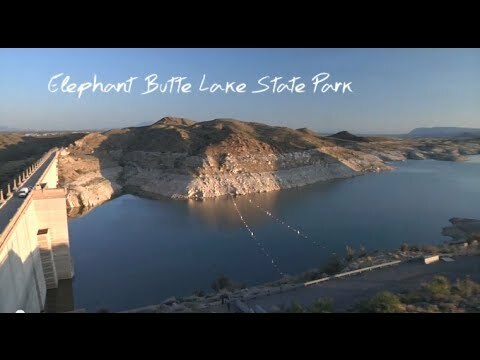 A destination for dives, training and scuba diving lessons, Elephant Butte Lake offers a popular dive site near the dam, but there are plenty of safe places and deep waters for you to enjoy this sport. Elephant Butte Lake is a frequent destination for those who own a parasail. The views of the lake, Turtleback Mountain, Sierra del Rio Golf Course, Rio Grande River, Elephant Butte Dam and the surrounding mountains and mesas are breathtaking. Flying above or at the edge of the lake ensures smooth air during the day even from the late spring to the early fall.